On Friday, April 6, ETSU Buccaneers head football coach Randy Sanders was reinstated to his position following disciplinary action. Sanders will receive a letter of reprimand. In addition, one week of his pay will be surrendered. This development followed Sanders’ April 2 placement on administrative leave. At the time, ETSU officials could only say that his leave was due to a potential violation of university policy. Following the Friday announcement of Sanders’ reinstatement, it became clear that previous allegations that he had struck a player in the helmet were true. Toward the end of the March 30 Buccaneers football practice, Sanders criticized one of his players for a poor play. This criticism led to a confrontation between the two individuals in which Sanders slapped the player on the helmet. Sanders tried to apologize, but the upset player walked off the field unabated. Sanders is the 18th head coach in the history of the Bucs football program. He has held the position since Dec. 17, 2017, having been hired to replace the retiring Carl Torbush. Sanders began his coaching career at the University of Tennessee in 1989. During his 17 years of coaching, the Vols compiled a record of 162-46-2. 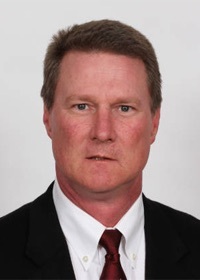 Prior to coming to ETSU, Sanders held assistant coaching positions at the University of Kentucky and Florida State University. The Bucs wrapped up spring practice with their annual Blue-Gold Game Thursday, April 5.